About five months ago I signed up for The Treasure Table, a monthly subscription box aimed specifically at Dungeons & Dragons 5th Edition DMs. The first box was supposed to arrive in February. I received an email from the guy behind this, explaining that he was having problems with his shipping company. Apparently he’d never used them before, and sure enough they were causing problems. This raised a red flag, that he went public with this process without testing out his shipping company, but such things happen. Finally, yesterday, on May 1, the March box arrived (!). Oh boy! Let’s open it up and see what’s inside. …Oh. That’s not particularly exciting. Let’s fold it out and see…. 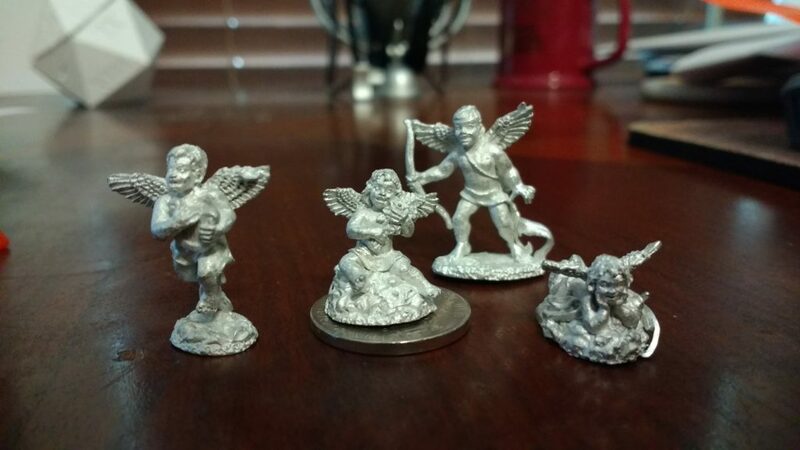 There’s a welcome letter, four pre-gens, a “love letter,” a tiny d4, and four “cupids and cherubs.” And here’s the problem: I might not be as disappointed if this arrived in early February in time for a Valentine’s Day-themed game, but it’s now May. Let’s look at the love letter. First off, it’s printed on a piece of paper that’s in that most Valentine’s of colors, orange. 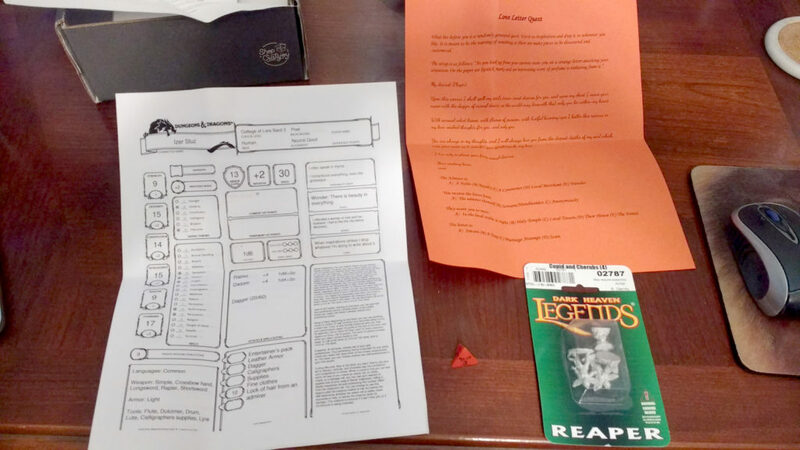 Second, you can’t even hand this to your players; it includes both text to the DM and to the player, and the letter begins with “My dearest (Player),” so you can’t just cut out the letter. Apparently, you’re supposed to re-type the letter from scratch. Also, a minor but significant note: Shouldn’t this be addressed to “My dearest (Character)”? I shouldn’t actually address the love letter to the player him- or herself, right? I understand that kind of mistake in a quickly-written social media post, but in the only page of game content you wrote for the month? Okay, what’s in the letter itself? Surely some interesting plot hooks! Surely some character nuggets! Nope, it’s just a long confession of love, with no information on the sender. Let’s read a sample! Okay, first off, why use archaic “knoweth” when none of the other words use that formation? Secondly, carving your lover’s name on your chest with the dagger of carnal desire is not only overwrought, it’s scary. Like, my PCs would burn this letter and avoid the sender at all costs. This would actively cause them to avoid any plot involving the sender. I live only to please your fiery carnal desires. Not to harp on the grammar, but I’m going to harp on the grammar: desires don’t feel pleased. Desires don’t feel anything. Desires are satisfied. But more importantly, this is even darker stuff that has a high chance of alienating players (and PCs). This isn’t just overwrought words of love, this is moving into deep D&S stuff. 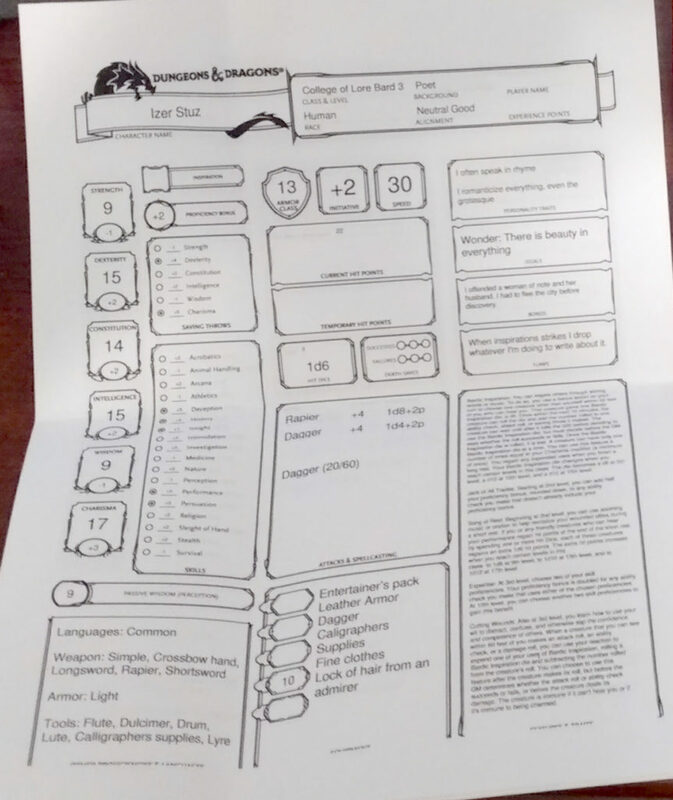 …nope, it looks like the creator found an online D&D character builder, chose a few race and class options and clicked “Generate,” then paired them with a random fantasy name generator (don’t believe me? The four characters are named Izer Stuz, Sabis, Eldea Valora, and Sivet Longfall). 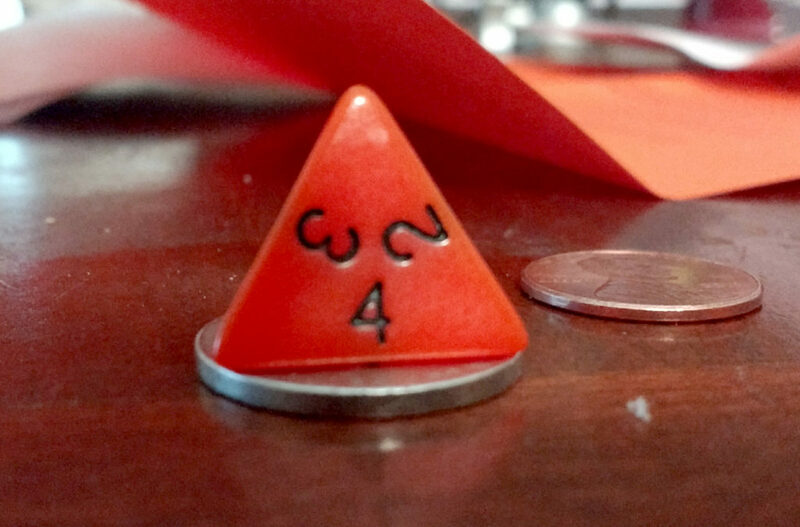 Besides the fact that the d4 is the second least-used of the standard dice array (that dishonor falling to the d12), this is also the smallest d4 I’ve seen. It’s literally the size of a nickel. But you get miniatures, right? Yep, four cupids! Most of which are smaller than nickels. And again, yeah, I get it, February means Valentine’s which means cupids. But it’s not February, and even if it were, there aren’t any cupid monsters in D&D. What am I supposed to do with these in-game? Did the designer stat them out? No. Okay, you may be saying, it’s slim pickings. But surely it’s not expensive. 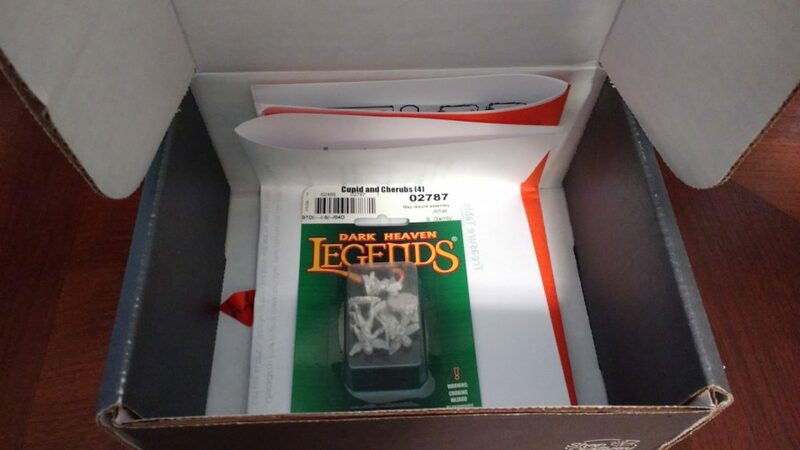 I paid $35 for this box. Now, granted, it normally comes with a t-shirt, and I opted out of that (I have too many t-shirts). But still, this isn’t worth $25. Heck, it’s hardly worth $10. 2 Responses to The Treasure Table: This is What You Get?!? I did a review also on youtube (https://youtu.be/H_2N4ZrFXMo). The difference was I got a d6 the same material color. So it means he got a bunch of assorted dice and broke them up. I am posting here on June 13th and as of today, there has been no word on the March (i mean May box) which was deep chill. I also see he has added a July box which will be werewolf themed. So we shall see what will happen. I haven’t received my crate at all (my son really wanted to get the Werewolf one), after 3 emails and multiple attempts to bill me for the next box. His birthday is this week, so I thought for sure 5 weeks was long enough, but I guess not. Thankfully I had switched to a prepaid card with no money on it after it had been a few weeks and I wasn’t getting a response, suspecting I’d be billed again for more. I’ve filed a complaint with my credit card company as well. This is at worst fraud, and at best someone with no idea what they’re doing.